July is a wonderful time in Wales as the summer is in full swing. The scent of honeysuckle fills the air, whinberries ripen on the hillsides, and the trees take on a deep green colour as the sun beats down on the lush Welsh countryside. On a sunny day in July, the sheep are brought into the farmyard for clipping and shearing. Welsh hill sheep have a coarse, rough wool that is mainly used in the carpet industry, because of its strength and thickness. 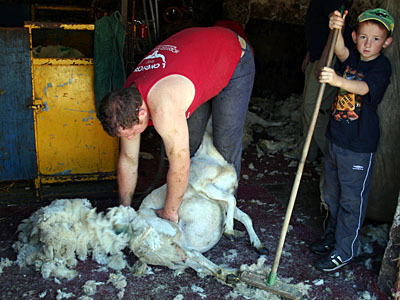 The shearer holds the sheep gently between his or her knees and clips with the shears, as close as he can to the sheep's body, taking off the wool in a complete fleece. A skilled person working with a machine can shear one sheep in less than two minutes - 250 sheep in one day. Fleeces must be kept clean and dry after shearing. Each one is rolled and then packed into a big sack called a 'wool sheet' ready for delivery to the British Wool Marketing Board for grading. Wales produces around 10 million kgs of wool every year. 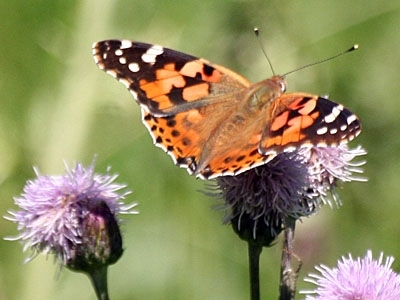 The spectacular painted lady butterfly migrates to Wales from north Africa every year. It may be seen basking in sunshine and feeding on the nectar of thistles in the fields around the holiday cottages throughout the summer months. If the average person were to close their eyes and think of a cloud, chances are they would picture this little fellow, sometimes known as a cauliflower cloud. 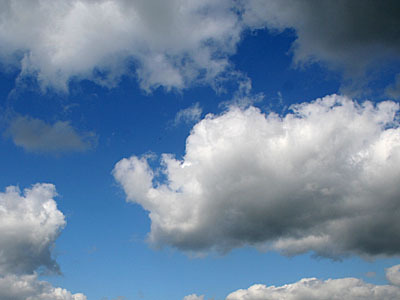 On sunny July days, the sky above your holiday cottage may well look like this picture - gentle tufts of cotton wool, born on the invisible thermals of air that rise from the Welsh countryside. You should notice this wild flower at some point during your holiday in South Wales. 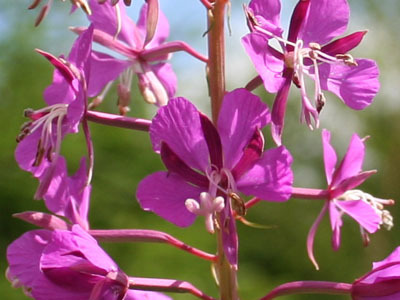 Once used as a garden plant, rosebay willowherb is now a common feature of the Welsh countryside. The leaves have been used by indigenous North American tribes as a fresh or cooked vegetable, a tobacco substitute and as a poultice to draw out infections. Recent studies have shown it to be anti-inflammatory with uses for nappy rash, sunburn and as a mouthwash. Even the pollen is claimed to produce good quality honey. It tends to grow at Plas Farm wherever we have had a bonfire which may explain why it is sometimes referred to as Fireweed. One of the delights of a July holiday in Wales at our holiday cottages is the abundance of whinberries that grow on the mountain. Prized over the centuries for their medicinal properties, whinberries are today considered to be a precious wild delicacy. 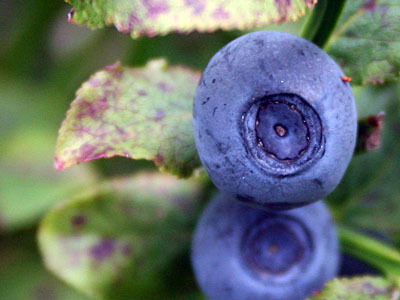 Also known as European blueberry, huckleberry, whortleberry, or blueberry, whinberries grow on a shrubby perennial plant, one to two feet in height. It differs from the American blueberry in that the meat of the fruit is purple, rather than cream or white. My grandmother once told me that they "taste of the mountain" and they are delicious eaten fresh with cream or in a pie. It is also possible to make country wine from them. If you are interested in picking some during your holiday, we can point you to the best places. This picture was taken in the Lodge field, alongside the lane to Cilybebyll. Rumour has it, that it is a section of Roman Road. I am not sure about this. Perhaps it is an ancient cattle drovers route. 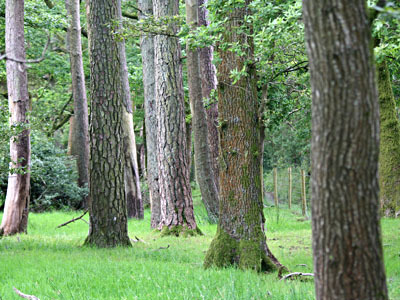 Whatever it is, it is now a picturesque corridor at the field margin, where sheep graze among Welsh Oak and Scots Pine. 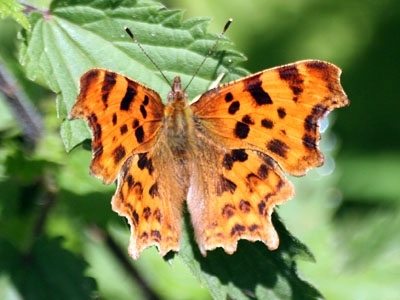 Once on the verge of extinction in Britain, the Comma butterfly (so called because of a comma shaped mark on its underwing) now thrives in South Wales. Our July guests can count themselves unlucky if they fail to spot one of these remarkable butterflies at Plas Farm during their cottage holiday in Wales. 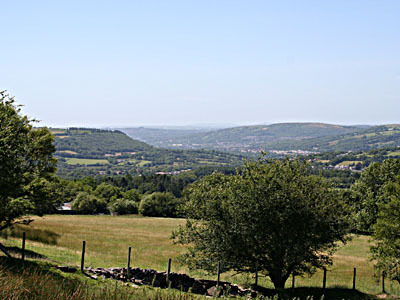 This picture was taken from the top field of Plas Farm and shows a view of the lower Swansea Valley which includes the towns of Morriston (home of the DVLA), Clydach and Trebanws. During July, you should be lucky enough to spot one of Britain's largest dragonflies. 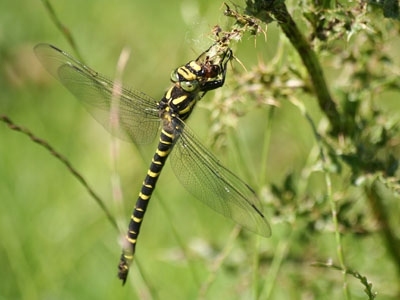 The Golden Ringed Dragonfly restlessly patrols the skies above thistle patches in some of the fields, attacking any unfortunate insects that fall within its sights. The longest bodied of all British dragonflies, it's black and yellow bands are the universal warning colours which serve to deter birds. Up close, its prominent eyes and fearsome mouthparts are a sight to behold. This insect is found principally on the western side of Britain and it is absent from much of England.